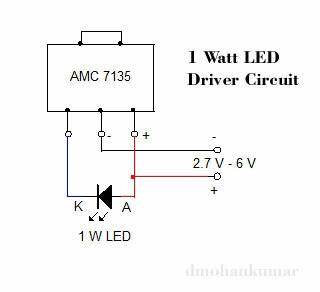 High current White LED requires constant current for giving maximum brightness. Connecting 1 Watt LED to the DC source using a current limiting resistor gives poor performance and the LED will be either too bright or too dim. More over, the low value resistor (10 Ohm or less) will heat up since the LED consumes around 200 to 350 milli ampere current . 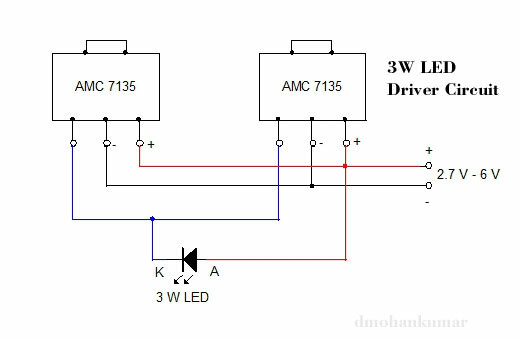 So here is a simple LED driver chip AMC 7135 that gives constant current (CC) to LED to give maximum brightness. It also increases the life of LED. It is too simple and enjoy the project. 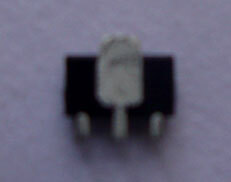 It is an SMD chip that includes the circuit for providing constant current (CC) for the LED. It has 350 mA constant current sinking capacity and Low drop out voltage. 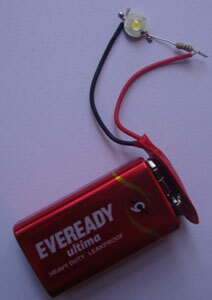 Its supply voltage range between 2.7 V – 6 V and with an Output short / Open circuit protection. The IC costs Rs. 25. 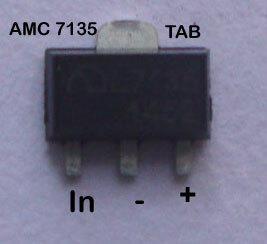 AMC 7135 Chip has three pins. From the facing side, these are In, Ground and Vcc. Cathode of LED is connected to the “In pin” and Anode to the Vcc pin. 2.7 V to 6 V DC is provided to the Vcc pin and Negative is connected to the middle ground pin. The ground pin also has a Tab for soldering which also act as a heat sink. A single chip drives one 1 Watt LED with constant current of 350 mA. So the DC source should be 2.7 to 6 V at 500 mA current. 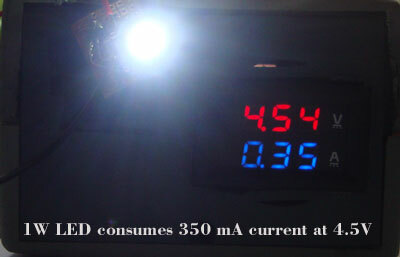 As the input voltage increases, current consumption in LED reaches its maximum 350 mA. For example between 4.5 volt and 6 volts. 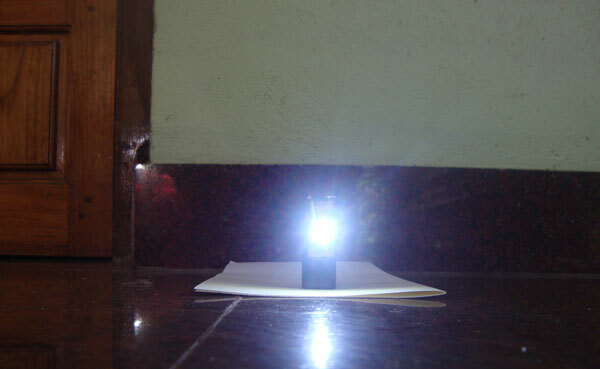 But below 4 volts, the chip delivers less than 200 mA current to LED so its brightness drops. So the ideal voltage is 4.5 volts. This LED is available in many types. Some have markings for Anode and Cathode as + and –. If not ,identify using a 9 volt battery with 100 ohms series resistor. Touch two leads with resistor tip and negative of battery. If LED lights, the lead in contact with the resistor is Anode. If not reverse. You can identify the leads easily. See image below. Since AMC 7135 is an SMD chip, it takes time to solder on a common PCB because its pins are very short. 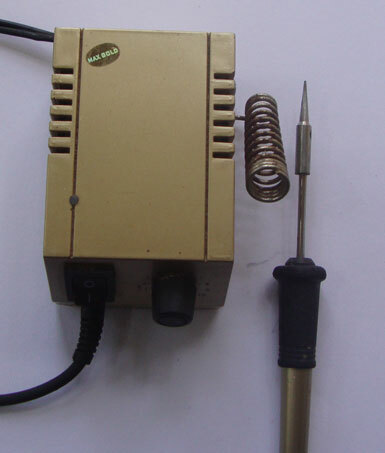 If you have an SMD soldering iron, the job will be easy. First solder the Tab of Chip to one point of the common PCB. Then slightly turn and solder the Vcc pin (3rd pin). To avoid shorting, use two thin cut resistor leads to solder with other two pins. Carefully solder the pins without shorting the pins. 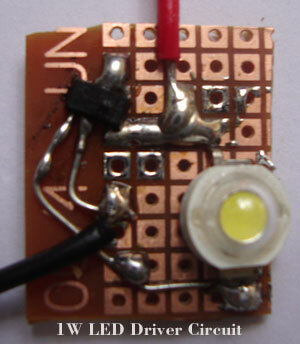 Now you can connect the 1 watt LED with correct polarity of Anode and Cathode. Caution : Do not increase the voltage above 6 volts . If so, both LED and Driver IC will burn. 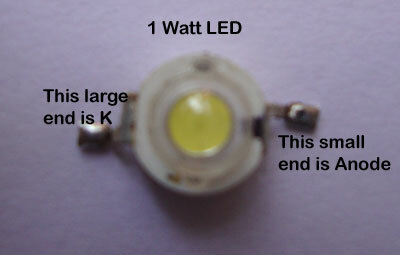 If a 3 Watt LED is used, two chips should be cascaded as shown below. 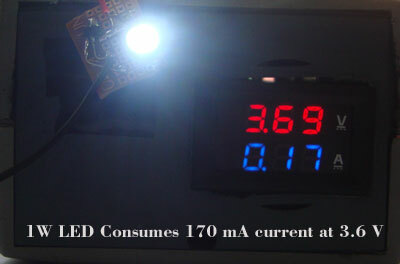 If more 1 Watt LEDs are used, chips should be cascaded as shown below. That means, each LED requires one chip. 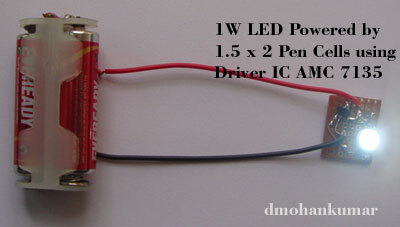 The Driver IC works very well in two pen cells that gives 3 volts. Voltage is not a problem for 1 Watt LED but current should be high. The 1.5 Volt pen cell gives around 1.5 Amps current. 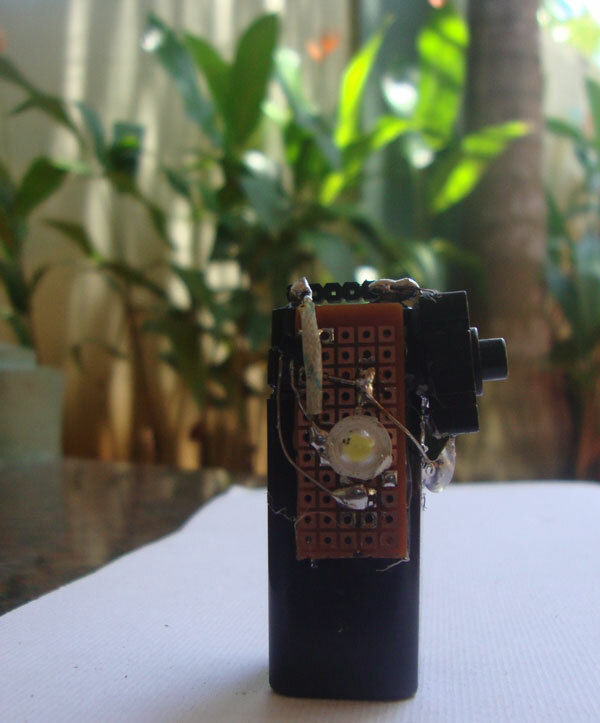 White LED Torch using LED driver , 1 Watt LED and 4 V 0.5 Ah rechargeable battery. Hi sir, I have a faulty constant current driver, crompton greaves make, CGDRVJ-6W model used for my led light. I would like to reconstruct it since i have around 10 Of such lights in my home. Can you please send me the circuit, the specifications are as follows. V in…. 230V, I in…. 0. 08Amp, V out 12-22 VDC and I out is 300mA.